This week UNC Greensboro’s Global Engagement Office held its annual three-day Summer Institute. The Global Engagement Office was created as part of our Quality Enhancement Plan from 2014-2019 and has done an excellent job building up UNCG’s global profile along with our International Programs Center and others. International & Global Studies is a partner and, as the Assistant Director of IGS, I have had many opportunities to support these efforts on our campus. I haven’t written on this much in connection with the library because I’ve been busy, but the ideas and activities we learned would be helpful for library services and instruction. A key part of this initiative has been on identifying and developing “intercultural competence” using the Intercultural Development Inventory. While the IDI approach isn’t perfect, it is useful for seeing intercultural competence as a continuum of development with actionable steps rather than a either/or stance (you are or you aren’t culturally competent). In addition to using the IDI with faculty, the continuum has been helpful for talking with students about their frameworks for thinking about cultural differences and similarities. We use it in IGS extensively and it is embedded in our study abroad program. Our main presenter on the first day was Darla K. Deardorff, who talked about the culturally responsive classroom. She took us through some exercises in her book, Building Cultural Competence: Innovative Activities and Models, including the story circle method and an action plan for developing intercultural awareness. Both activities are helpful for identifying areas for personal intercultural competence development and are described in the book if you are interested. The second day we watched an excellent TED Talk by Eduardo Briceño that talks about developing skills by balancing the time we spend in the Learning Zone (time for learning and deliberate practice) versus the Performance Zone (time for performance of our expertise). This video really resonated with me because as library instructors we spend entire semesters in the Performance Zone and struggle to find time for reflection and deliberate practice in between all the “performances.” A faculty panel then discussed the video and related it to their practices in developing intercultural competence in the classroom. Some of the ideas included leaving open days in the class for student-driven topics and providing ways for students to share experiences. This led into a discussion about overcoming resistance, including some strategies (scroll down to the bottom of that page). Today, a group of international students from Niger, Sweden, Nicaragua, Iraq, China, and Libya came to talk about their personal experiences in an American classroom. They talked about differences in regards to the professor’s role (facilitators versus experts) and expectations about deference to the professor. I found most useful their discussion of classroom dynamics, such as group work expectations and classroom behavior. For example, most were surprised that American students would leave the classroom during class to go to the bathroom. Seems like a small thing, but I can definitely see how that would be a shock if a student were accustomed to a stricter environment. We closed out the day with Josephus III, a performance artist and poet. In addition to sharing his poetry, he talked about ways to help students engage with challenging concepts. Overall it was a wonderful three days of talking with an extremely diverse group of faculty and staff from all over the campus and representing almost all of the academic units, including the library. I attended the institute for my position with IGS, but much of this content is critical for libraries. International initiatives have been discussed in the library world frequently, but the efforts seem slightly piecemeal and overwhelmingly service focused. In other words, do we have the resources to support patrons who want to learn about this topic? Or are we able to support the research needs of international students? Certainly, discussions of library anxiety, microaggressions, and diversity in the library hit at the ideas underlying global engagement and intercultural competence For example, Cynthia Mari Orozco provides some excellent suggestions for helping reduce library anxiety. Nevertheless, I haven’t seen as many developmental approaches like the IDI being used to help library staff progress over time. Do you know of a library that has used the IDI or a similar tool in a systematic way and then followed through providing support with developing intercultural competence? Are there global engagement building approaches that are not predicated on the American experience with diversity? Just some questions I thought about during the institute. And, hey, summer has started, so time for a new research project, right?! Tonight I am heading out for the IFLA World Library and Information Congress in Wroclaw, Poland. The city is special for me because I studied abroad there in 1995. In preparing the trip, I noticed that the congress meetings are being held at the Hala Stulecia. I was quite confused at first because I didn’t remember anything with that name. Finally it hit me — they had renamed the large meeting exhibition hall in the east of the city. The building I knew had been called Hala Ludowa, the People’s Hall, but that wasn’t its original name. 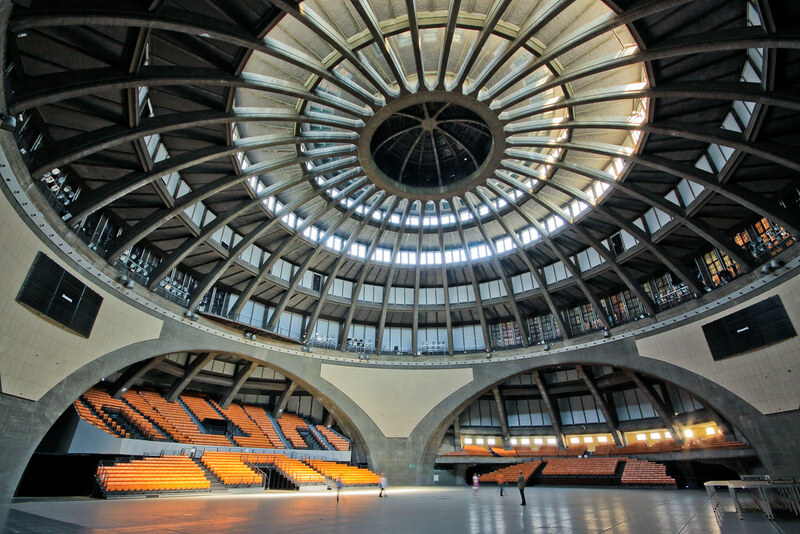 Designed by German architect Max Berg as a commemoration of 1813 victory against Napoleon, it opened in 1913 as Jahrhunderthalle, or Centennial Hall. Since the mid-18th century, Wroclaw, named Breslau, had been a part of the Prussian Empire and then the German Empire. After World War II, the city and region became part of Poland and the majority German population were expelled, fled, or resettled in Soviet-occupied Germany. After the fall of Communism, the hall remained Hala Ludowa until the mid-2000s when it was renamed Hala Stulecia, the Polish translation of Centennial Hall. In 2006, it was listed as a UNESCO World Heritage site. For my historians and archivists, here are some great historical photos. With the debates surrounding our own monuments, it might be helpful to look at this issue from another perspective. Wroclaw and all of Poland have had a difficult history to contend with many times over, and we all know the history of Poland’s emergence and demise and reemergence (hopefully). In addition to dealing with political changes, Poland has contended with powerful symbolic politics during its history. Hala Stulecia is great example of that attempt to confront the past through shifting memorialization. In particular, the hall when built had a large Iron Cross built inside its dome. During the Communist period, the Iron Cross was covered with large piece of fabric. When I was there, the story was that the Cross had been built into the dome and was part of its support structure (I don’t know if this is true). The Communist authorities couldn’t remove the Cross without damaging the dome so they used the sheet. That sheet was still there in 1995. Looking at more recent pictures the sheet is gone and it appears that the Iron Cross has been removed. I can’t find a good photo that confirms that it is still there or not. While I am certain that there are some residents who would lament the loss of this specific memorialization, removing symbols does not equate a loss of the past. Removing the Iron Cross or changing the hall’s name is a recognition that the society has changed and that the symbol no longer resonates or that it resonates in a new way in the present day. Names can change without causing harm and memorials can be rebuilt or brought down without forgetting a past. In the United States, we will always have the scars of slavery and the Civil War imprinted in our books, told in our classrooms, and reverberating in our society. We don’t need the monumental reminders that the Jim Crow era tried to re-establish a racial order many years after slavery ended. Similarly, Wroclaw doesn’t need to hide its past or keep in a public hall a symbol that was later adopted by a regime that killed millions. I look forward to seeing Hala Stulecia again with new eyes and its new name. I hope that the Iron Cross is in the Wroclaw museum, where it belongs, and I hope IFLA attendees visit the museum to learn more about Wroclaw’s past. Because people have been asking me about this trip, I will try to blog regularly and post pictures. I am new to IFLA, but I am excited to be a part of this international community of librarians.